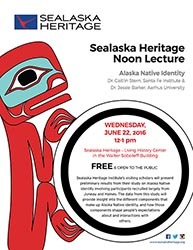 Sealaska Heritage Institute (SHI) will sponsor a lecture by two visiting scholars on the preliminary results from their study on Alaska Native identity involving participants recruited largely from Juneau and Haines. The scholars, Dr. Caitlin Stern and Dr. Jessie Barker, have been conducting research in Southeast Alaska since May through SHI’s Visiting Scholars Program. As part of the program, SHI asks that scholars share their research with the community as a public service. The first part of the study is a survey, with a follow-up online group activity and in-person interview. In the survey, participants report the communities and groups of other people with which they have familial and cultural ties, and rate the strength of their connections to these groups. Participants also answer questions about how they perceive other people with whom they share or do not share certain aspects of their identity, and about how they might behave towards those people in different situations. The data from this study will provide insight into the different components that make up Alaska Native identity, and how those components shape people’s expectations about and interactions with others. Dr. Stern is originally from Haines and is now a researcher at the Santa Fe Institute in New Mexico. Dr. Barker is a researcher at Aarhus University in Denmark. Both scholars are biologists interested in social behavior — for example, how people interact with others in groups, and how people perceive themselves in relation to others in different social contexts. The lecture is scheduled 12 pm, Wednesday, June 22, in the Living History Center at the Walter Soboleff Building. The lecture is free and open to the public. The study was sponsored by the National Science Foundation. SHI sponsors a Visiting Scholar Program for graduate students enrolled into an accredited educational institution or professors engaged in research that advances knowledge of Tlingit, Haida or Tsimshian culture, language, arts, or history. CONTACT: SHI President Rosita Worl, 907.483.4844; Dr. Caitlin Stern and Dr. Jessie Barker, alaskastudy2016@gmail.com or call/text 617.417.2469.